Combating the opioids crisis is a top priority for the Missouri Department of Health and Senior Services (DHSS). The department is working with sister state agencies, local health departments, hospitals, law enforcement and other partners to fight this modern plague. We know that every person saved from an overdose or connected with rehabilitation resources is a mother, father, sibling or child to someone else. DHSS’ efforts include a series of nine Opioids Summits held around the state including Cape Girardeau, Columbia, Joplin, Kansas City, Kirksville, Poplar Bluff, St. Joseph, St. Louis and Springfield. The department is also working to track data related to opioids misuse to show where efforts are most needed and where progress is being made. Working with the governor’s office and the legislature, DHSS has helped enact new measures to save lives and improve the lives of those who struggle with opioid addiction. DHSS has also partnered with the MO HOPE Project to help provide education and resources. The passing of Senate Bill 826 that limits initial new prescriptions of opioids to a seven day supply. This bill allows the Bureau of Narcotics and Dangerous Drugs to implement rules so drug disposal boxes may be placed in pharmacies for citizens to use. 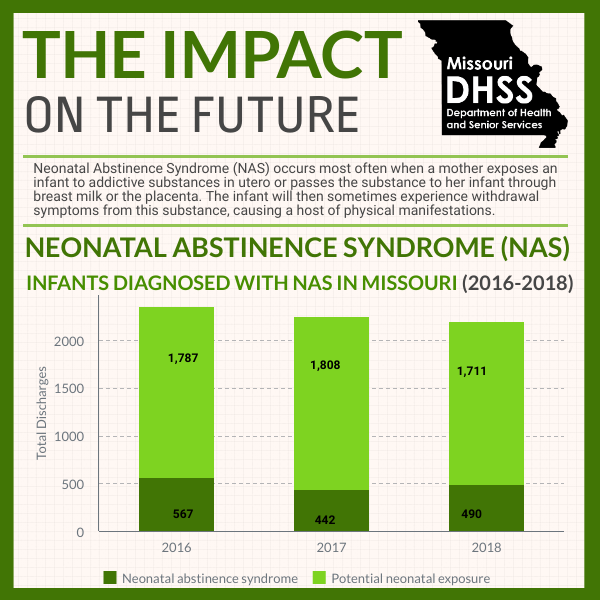 The passing of HB 2280, which extends MO HealthNet (Medicaid) coverage an additional year for mothers in need of substance use treatment. The extended coverage would be limited to benefits for substance use treatment and mental health services so long as the woman remains adherent with the treatment. Missouri is the first state in the nation to pass such a policy. Establishing the St. Louis Emergency Operations Center. The Missouri Departments of Health and Senior Services, Social Services, Corrections, Public Safety, Economic Development and Mental Health in partnership with the City of St. Louis Departments of Health, Human Services, Fire, EMS, Police and the DEA have launched St. Louis Emergency Operations Center, a command center aimed at reducing opioid overdose death and homicides. The command center operations will take place from the City of St. Louis Department of Health. The command center response team will utilize predictive analytics and public health intelligence to guide interventions. The response team will perform secondary assessments to determine the need for substance abuse treatment and/or additional wrap around support or services, once individuals have been duly stabilized by City of St. Louis emergency first responders. Creating the Missouri Overdose Rescue and Education (MORE) project through a federal grant awarded to the Bureau of Emergency Medical Services to provide naloxone to first responders and train them on administering the nasal spray to reverse an apparent opioid overdose. 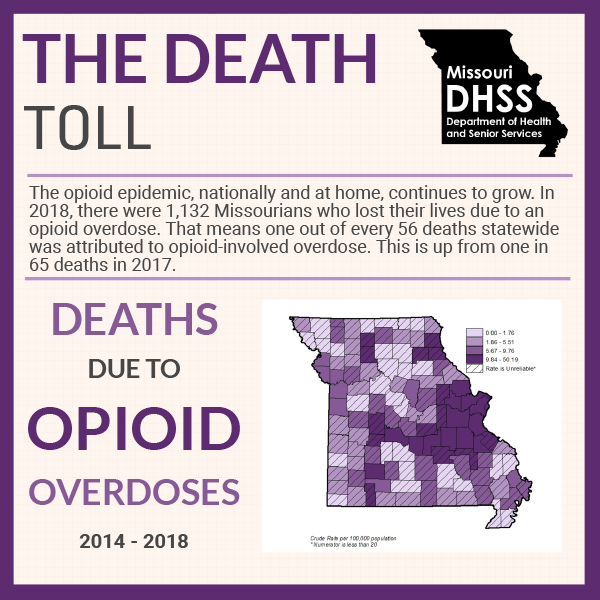 For more information on Missouri’s government-wide approach to the crisis, visit https://opioids.mo.gov/. The data presented here are relevant to the opioid misuse epidemic in Missouri. These data tell a troubling story: the opioid epidemic affects all genders, all races, and many age groups in both rural and urban Missouri geographies. The impact is multi-dimensional and multi-generational. Trends indicate that the scourge of misuse in our state, and nationwide, continues to affect people across all demographics. Clicking the images below will lead to detailed graphics and analysis that feature data from Missouri death certificates and Missouri hospital and emergency room records, among other sources. Contact us for direct questions or more specific data requests.